Danielle Daskalakis entered the Women’s Wall Ball Singles final as the defending champion, having overcome an outstanding field in Canada three years ago, including beating her finals’ opponent Martina McMahon in the round of 16. This version of McMahon was a far different version than the one Daskalakis defeated 21-3, 21-7 in Canada three years ago, as McMahon 2.0 made that very clear from the start, taking game one 21-15. Daskalakis rallied in game two, building a 6-1 lead and maintaining the momentum en route to a 20-11 advantage. “It just feels like these two play the same game,” stated WPH play-by-play broadcaster Dave Vincent in reference to the two lefties. Daskalakis stalled at 20-11, allowing McMahon back into the game. A “block” argument at 14-20 caused Daskalakis to lose her concentration, as Daskalakis thought she won the rally but was forced to replay the rally. Daskalakis was visibly upset and dropped the next four points to see her once nine-point lead shrunk to two. Daskalakis summoned the champion within, closing out the game to force a tiebreaker for the title. Daskalakis made three consecutive right hand return of serve errors to stretch McMahon’s lead from 5-3 to 8-3, effectively ending the match. McMahon closed out the match to claim Ireland’s first Women’s Wall Ball World Championship. “This is really great for Team Ireland to win this, since we only really started playing Wall Ball in 2012,” stated Reilly. 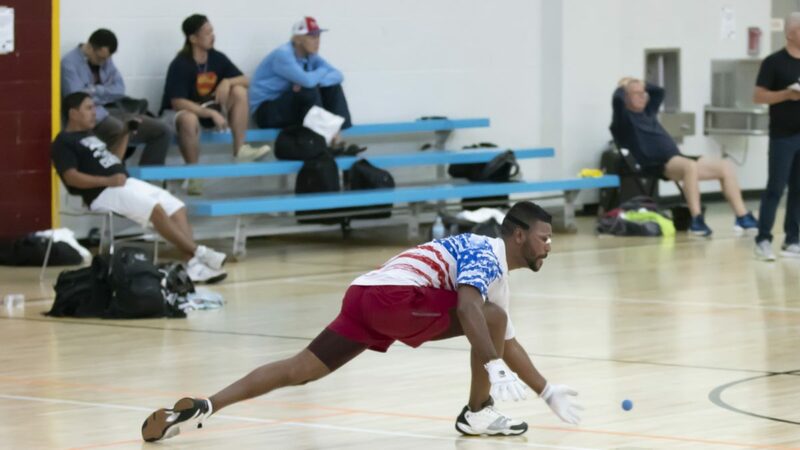 Longtime New York rivals and friends Willie Polanco and Joe Kaplan met for the 1-Wall Small Ball World Championship, with both stars demonstrating world-class skills in their middle age. Polanco survived a razor close first game against the serve-and-shoot specialist, controlling the long rallies on the slow indoor 1-Wall court. Polanco led 17-14 in game two, but Kaplan continued to grind, eventually tying the score at 17. Serving with the momentum and four points from a tiebreaker, Kaplan served into Polanco’s power side, leading to a Polanco drive and side out. Polanco regained control, scoring the next two points to take a 19-17 lead. Polanco missed an easy opportunity to score the 20th point after a seven-shot rally, steering a right-hand paddle kill wide with Kaplan stuck on the left side of the court and giving Kaplan another opportunity. Kaplan followed with his own hand error, failing to capitalize on the opening. Polanco took advantage of Kaplan’s error, serving out the match for the world title. “Kaplan in one tough hombre, but he just couldn’t climb Mount Polanco,” barked Vincent. The Wall Ball men’s doubles final produced the longest match of the championships, featuring three grueling games spanning nearly two-hours and 40 minutes. Team USA took game one and stood at match point in game two with McKenzie serving at 20-18. McKenzie played three consecutive offensive opportunities to the middle of the wall, allowing Quish to capitalize on a setup to earn a side out. 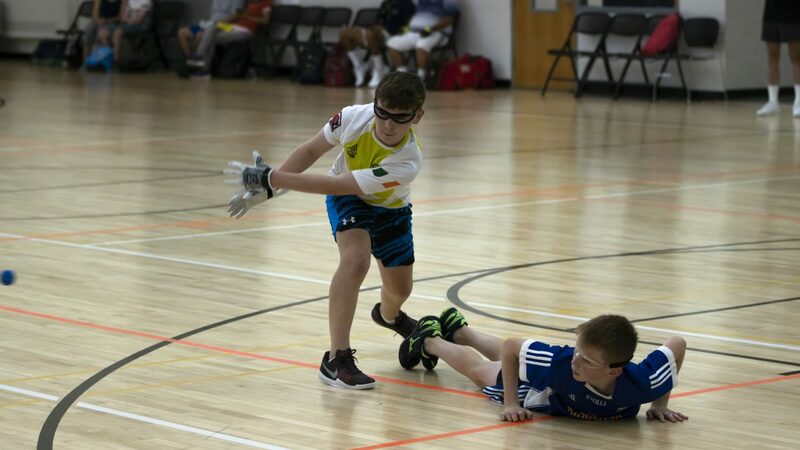 Team Ireland scored three consecutive points to force a tiebreaker and grabbed a quick 3-0 lead in the tiebreaker. 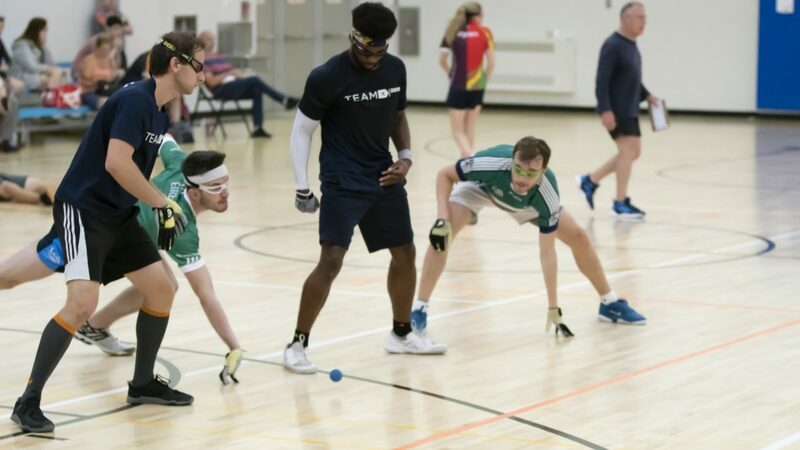 Five glove changes, 17 floor wipes, three timeouts, and 45 minutes later, Team Ireland and Team USA were deadlocked at 6-all, with a race to five to win the world title. Team USA played aggressively, scoring the final five points of the match, punctuated by a Klym flat roll at 9-6 and clutch shot making by McKenzie. 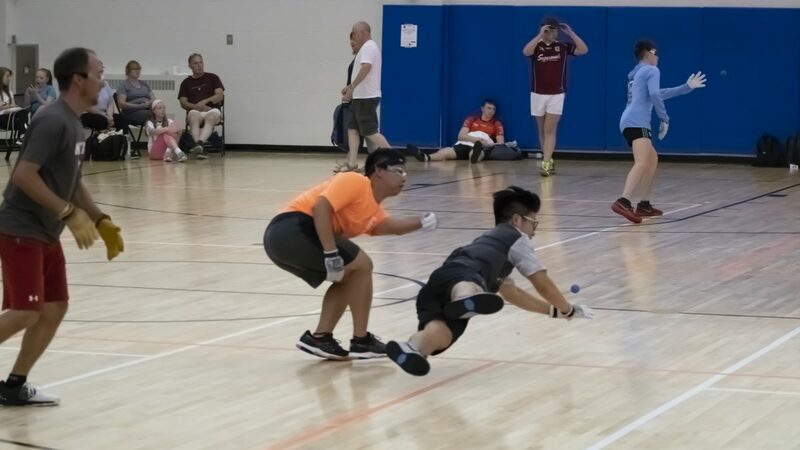 Team Polanco/Kaplan had too much experience for Kody Yan and Steven Woo, as the veterans swept the youngsters in two games to give Polanco the 1-Wall Small Ball slam. The top men’s 4-Wall stars in the game kicked off the round of 32 with no surprises, setting up scintillating round of 16 matchups on Wednesday. In the only tiebreaker in the round of 32, the Olympic Club’s Erik Torres overcame the GAA’s Darragh Daly, needing nearly two hours to advance to the round of 16, 21-19, 19-21, 11-9. 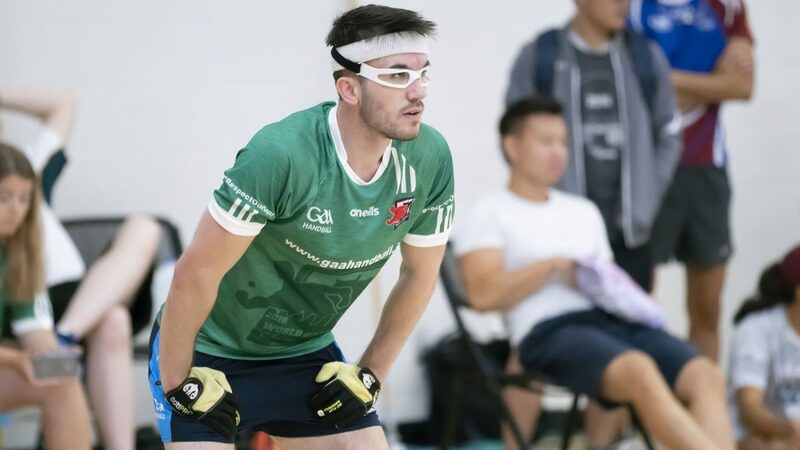 Sensational wins for Team Ireland’s at the World Championships in Minnesota today when Conor McElduff and Martina McMahon were the first Irish players to win Wallball Senior World titles. McMahon was first into action and she was playing the number 1 seed and reigning 2 time World Champion Danielle Daskalakis (USA). McMahon attacked from the outset going for kills when given half a chance, she built up a good lead but Daskalakis was trying every trick in the game to claw her way back but McMahon closed it out 21-15. In the second the American started the brightest but McMahon kept with her for long periods. Daskalakis led 20-12 at one stage but McMahon dug deep and fought back to trail 18-20 to the delight of the large crowd. But the American got the final ace she needed to setup an eagerly anticipated tiebreak. McMahon was very composed in the tiebreak and started well even though points were hard to get, but with some excellent attacking shots she went into an early 6-2 lead. The Limerick lass was really playing to the crowd and she extended her lead to 9-4. 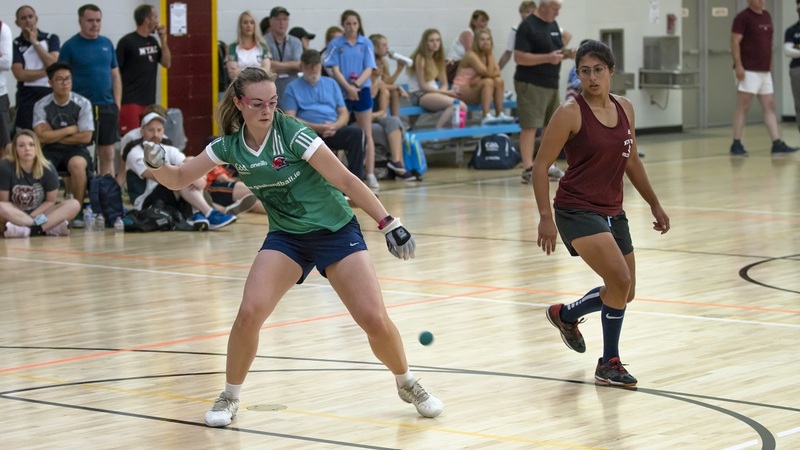 The American tired everything but today the girl from Limerick was on top of her game and she celebrated in style when she took the tiebreak 11-4 to be the first Irish person to win a Wallball World Senior title. Next up was Conor McElduff playing Vlad Klym (USA) and after McMahon success this really spurred on the Tyrone player. McElduff started brightly and went into an early lead, with some outstanding kills and passing shots he went on to take the first 21-6. The second game was a very cagey start by both players with it at 5 all but McElduff started to exercise his influence and controlled the game from this stage on to the delight of the large crowd watching on. In the end McElduff took the second and the World title 21-6 and 21-8 to everyone’s delight. The big guns entered the 4-Wall Championships today with reigning World Champion Paul Brady receiving a bye while Irish Team Captain Martin Mulkerrins defeated Jeff Strebig (USA) 21-4, 21-12. Also successful through to the next round is Robbie McCarthy who defeated Quinn Foley (USA) 21-1, 21-4 while Irish Senior Doubles Champions Diarmuid Nash overcame Loren Collado (USA) 21-6, 21-4. Mens Open Singles R32: Paul Brady (Team Ireland) W/O Ricardo Fernandez Jr (Mex) scr. Mens Open Singles R32: Sean Lenning (USA) dft Eric Hillgren (USA) 12-8 ret. inj.